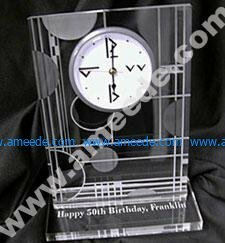 Frank Lloyd Wright, the famous architect known for creating over 1,000 houses using experimentation with obtuse angles, circles, and lines, inspired this acrylic desk clock made from a sheet of acrylic. You can use the design we created, or play with designing your own. It’s easy and you can use any shape to make a customized design. It makes a great desk clock, and you can even personalize the base for an added touch! While we used 1/2” acrylic to make our desk clock, if you have a low wattage laser, don’t let the 1/2” acrylic scare you away – you can use any thickness of acrylic to make this beautiful clock. When you open the file in CorelDRAW, the page is set up at 14″ x 8″. Depending on the size of acrylic you have or how large you wish to make your clock you can re-adjust the page size. You can add writing at the base for someone’s birthday or another special occasion or leave it blank. Make certain the writing is backwards as shown in the picture so that when it engraves onto the acrylic it will be positioned correctly for people to read it. The file combines both raster engraving and vector cutting. Depending on the type of material you are using, the thickness of it and the wattage of the laser you are using will depend on how you will set up your Raster and Vector engraving speed and power. When you send the file to the laser, all of the lines and circles in the file are going to be raster engraved EXCEPT for the larger hollow circle in the middle of the larger piece located at the top. This will be cut out to insert your clock face. The entire base will be vector cut. Also, the width of the cut in the base will need to be adjusted based on the thickness of the acrylic being used. Now, you can see all your clock pieces and put them all together. The Clock insert goes in the middle of the top piece. The top piece gets inserted into the base and you’re done!